Ken Tang why not 7%? how do you calculate though? which part of calculation do i fail? Tipster Just see if you all could sell on a high..
newinvestor17 Impossible to go to 1.8 by the 31st December 2018 Tipster. BetorInvest What is going on with the big volume of share transfered among substanstial share holders? cong5895 stable result with stable dividend. dunspace Any ideas on what is happening with the mall at johor? KassimBaba7 dun quite get the demand - yield at this price is marginal yet the sharks are willing to prop shares up to this level? Hmmm.. even with Pav2 around the corner I'm predicting a temporary drop before they will gear up to their original values. KassimBaba7 Reference to Pavillion 2 Bt. Jalil.. PAVREIT price also rise to all time high.. 1.7X.. Disposed mine already for higher yield reit. Pav2 is huge and most likely will need time to generate results. Note PAVREIT has Damen Mall which is not performing well and eats back on the income against high operating expenses, though Pav Bt. Bintang is doing exceptionally well. wanttoearn KassimBaba7, which is a better REIT to invest in than PAVREIT ? 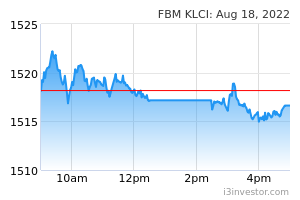 hellbender EPF selling at RM1.8 why still push up this stock? while this is the best shopping mall the share price is rather high. wkl318 Whether price is high or low is up to individual's opinion. Just look at TP 1.50 of KENANGA and TP 1.91 of HLG. Don't you agree it is their analyst's opinions? To KENANGA 1.50 is fair price but to HLG 1.91 is fair price. Who is right? Both are right of course otherwise why did their company print their write-up. maxcore Why drop 1.52?..seems to be on the steady side. maxcore I dont get your statement..
ocpd "Malaysian REITs yields to stay at 4% to 5% this year"
LATO' SELI Igbreit all year high. tokohM IGBREIT gila naik with decreasing net income and flat DPS. why? ronaldo123 Becareful with this share.